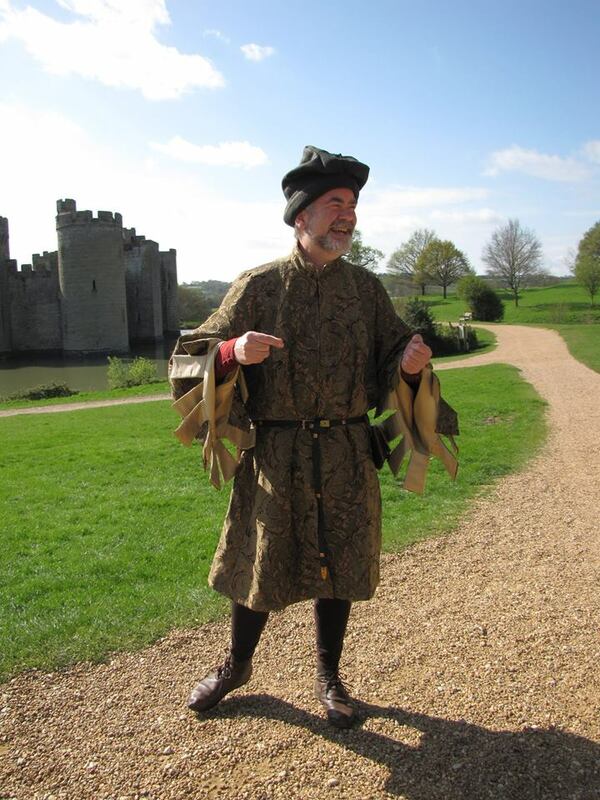 Bodiam Castle features in episode 1 of BBC1’s new programme ‘A Taste of Britain’ with Janet Street-Porter and Brian Turner. You can catch it on iPlayer here for the next 13 days. I get a walk on part at about 18 minutes in! 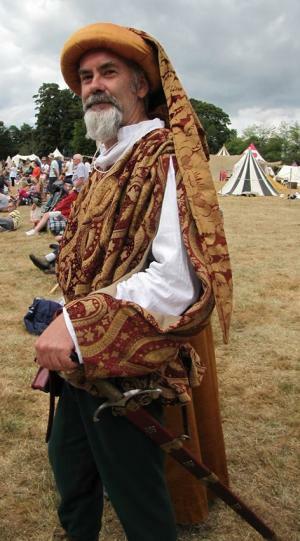 To add to the charm of the castle, there are a number of volunteers [sic], dressed in era-appropriate garb, who will inform you of the life within a busy castle and tell tales of many interesting things that would have occurred within. I was surprised at how these colourful characters added such significant depth to the overall experience. I particularly like that last sentence. I add the [sic] as the team has a core of staff live interpreters working in conjunction with volunteer live interpreters. The team is working hard on presenting our ‘May Games’ programme of presentations this month. 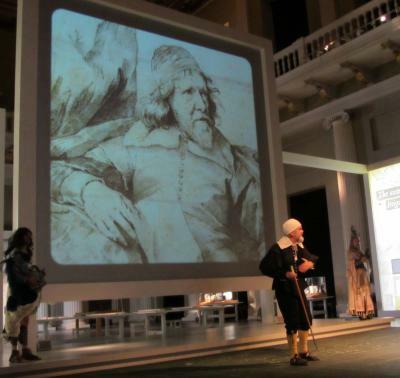 We’re also preparing next month’s programme which will consist of some ‘Untold Stories’. It’s been a hard few months building the new team and trying out new ideas but we’re learning a lot and, I hope, interpreting the castle imaginatively and entertainingly. I look forward to having a bit of time to reflect on it all. 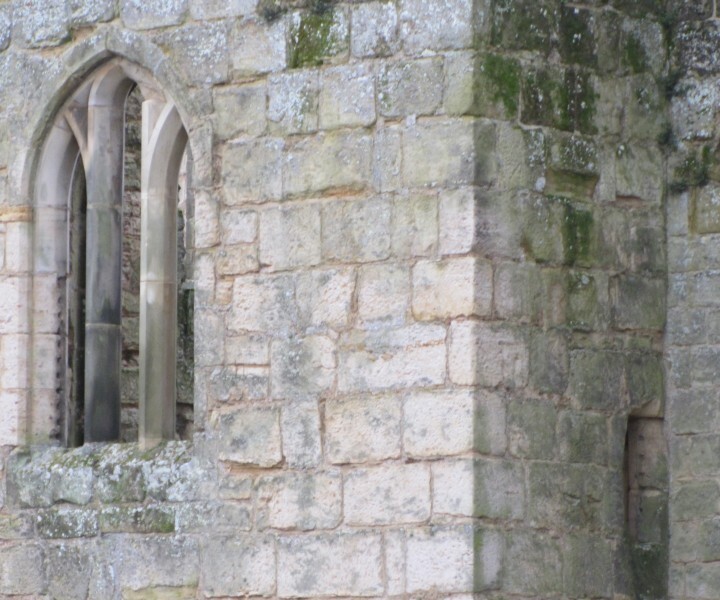 This post looks at a window in the Chapel. The chapel is dominated by the restored east window (F). The chancel would have been at a higher level than the current platform. The piscina to the left of the Sacristy (priest’s room) doorway (D) indicates this. The floor level was approximately where the middle rail of the new fence is. Patterned tiles were found when this area was excavated in the 1920s. George Curzon describes them as “small glazed tiles, with bevelled edges, of blue, yellow, green and brown colours” in his 1926 report. Fragments of stained glass were also found. The Lord’s and lady’s apartments are immediately south (to the right) of the chapel. The window to the Lord’s room (A) can be seen high up on the right. This is where the Lord and Lady and their important guests would be during the mass. There is also access to the upper floor at B. I am not sure whether this would have opened onto a wooden gallery. 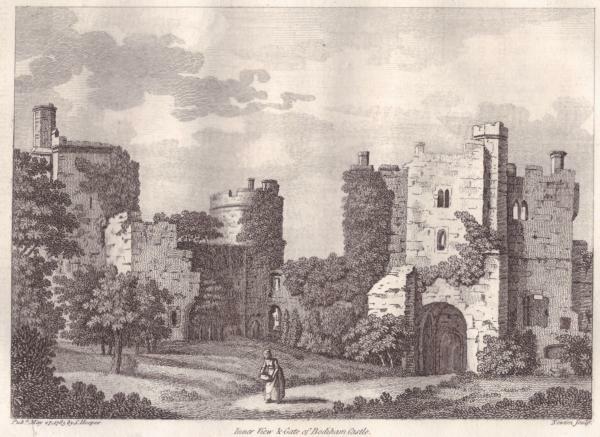 There is a door to the “Lady’s Bower” from the knave (C). There may have been a door between the chapel and the courtyard but no evidence of this has been found. 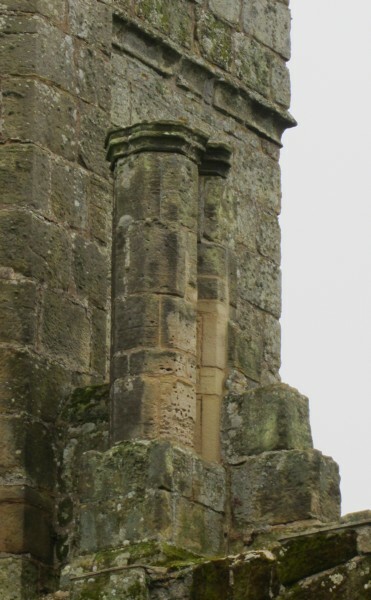 It is the small north window indicated by the arrow (above) that is this post’s ‘bit’ for today. It’s a narrow window set much lower than the east window. 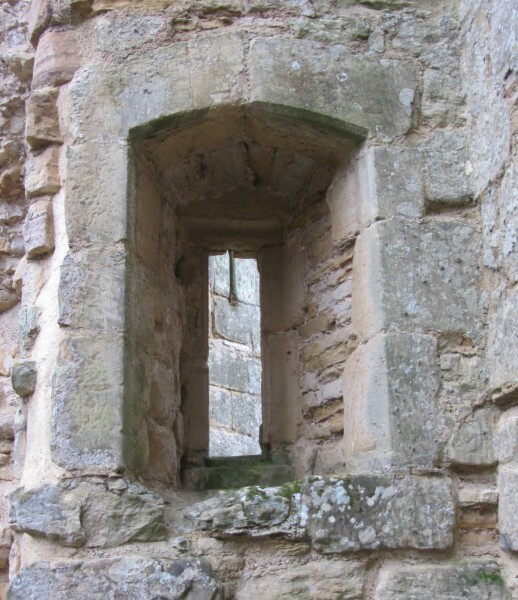 Early writers on the castle suggested that it was a dole window or lepers’ squint. A dole window is where the poor might come to receive charity. A squint is an opening through which those not in the knave of the church might see the host being raised by the priest. Lepers would not have been allowed inside a church. The window would traditionally have been barred and/or shuttered. Pic. 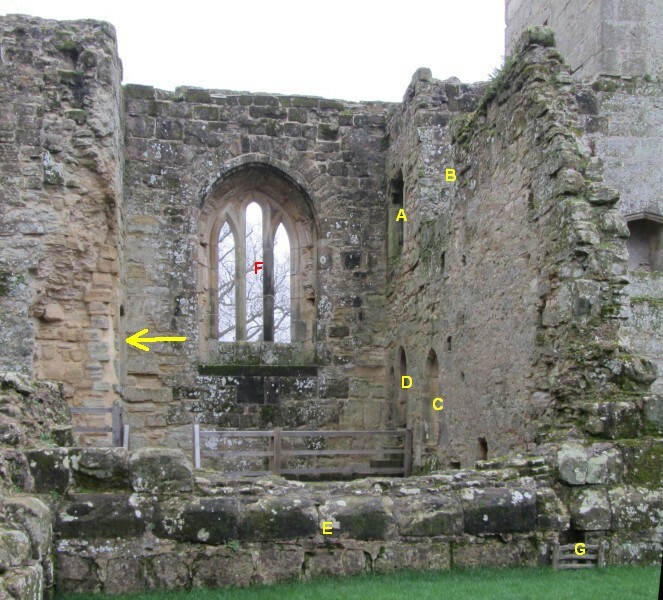 3 shows how the chapel breaks the symmetrical rectangle of the castle. Its projection creates the narrow, north facing chancel wall. The north window is clearly visible. You can see that it is set much lower than the east window but it is still high above the water. Even with a boat there would be no chance of receiving doles or seeing anything. The projecting NE drum tower blocks any view of the window from the distant north bank of the moat. In pic. 2 you can see a window in the NE tower’s lower residential room through the window in question. Could our window be a squint for someone in that room? A quick trip to the room (now a display case room) and a sneaky look from the windowsill discounts that as a possibility. You can see into the chapel if you crane your neck, but the angle means that you look into the knave rather than the chancel. which, on the face of it sounds reasonable and defensible. He also, in the same section, makes the case for a now lost west door and window. However, the size of the window, its low setting relative to the interior and its north-facing aspect in what is effectively an alcove suggests that the amount of light it would contribute would be negligible. A west window, which Curzon argues for, would be much more effective and could be much larger. Why go to the cost of engineering a small window on the dull side? 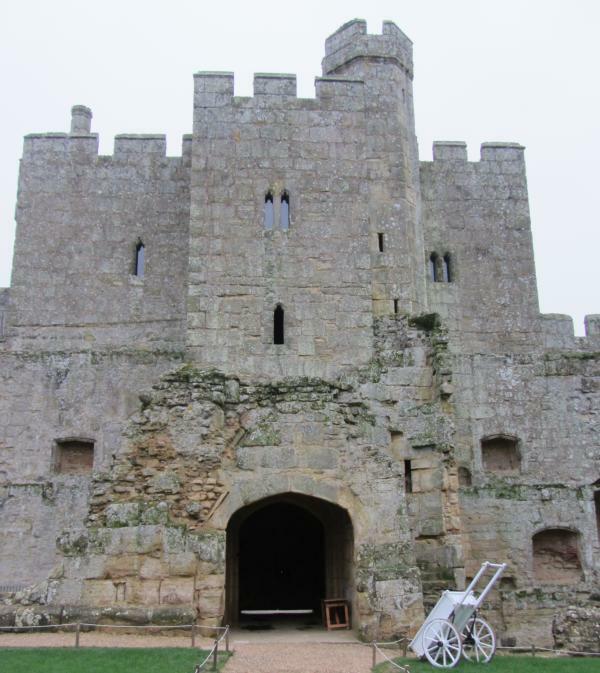 It could just be a poor choice – the castle, though impressive, is not perfectly designed and engineered. Could it be, however, that it is an architectural quote – a symbol? People seeing it would have associated it with acts of charity. 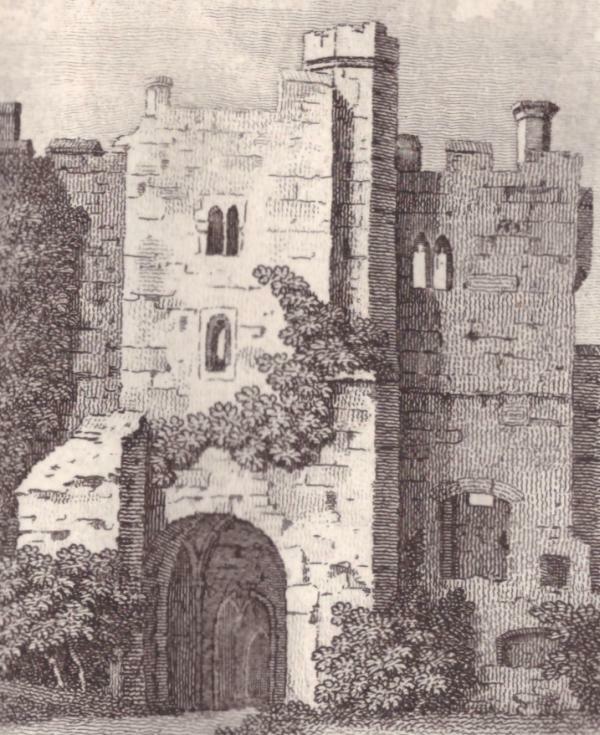 The castle is full of all sorts of symbolism, both military and domestic. Many of the military elements are famously ineffective except as symbols. 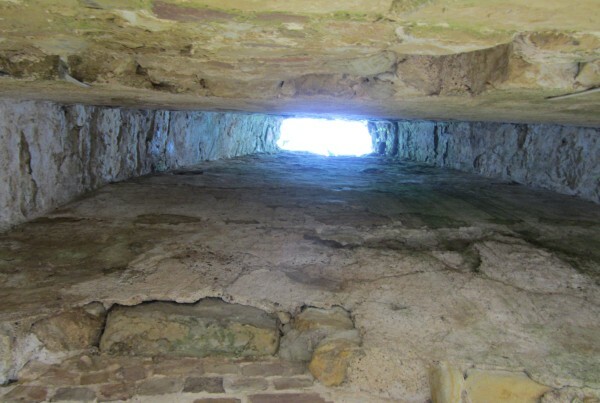 Perhaps this window is there to show people attending mass what a beneficent man the builder of Bodiam Castle is. 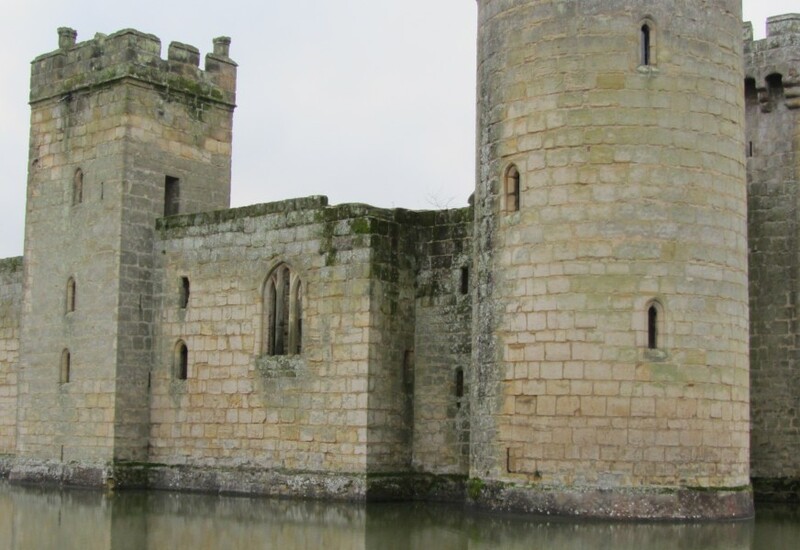 It doesn’t matter that the window is impractical – it tells a story, as so much of the castle is designed to do.